Are You Willing to be a Beginner Over and Over Again? I’ve always wanted to paint. Instead, I made my own clothes, practiced interior design, danced, wrote, and even taught. But I always wanted to paint. Whenever I’d sit down and try to paint, I always found a reason to stop – my technique wasn’t developed enough, I didn’t have any natural talent, I didn’t have the time to put into it, etc. Most of the time, I never even knew what I wanted to paint – what I should paint. With all of these roadblocks in my way, painting just didn’t happen or work. Sometimes I ended up painting flowers, but I got bored painting them, so my painting failed miserably. When it came time for higher education, I decided to study Applied Art and went on to successful career as an interior designer. Heck, it was Applied Art! I loved the professional life, and was good enough for my clients to call me back again and again. I designed for years, fighting trends and encouraging those I worked with to find out who they were before we did their design. This style of designing became my message. I was a beginner once again when I took my design on television. I had to consider presenting on camera and being very concise so the idea got across in a ten minute segment. After five years on television, I decided to write a book. Yes, it happened again – I was back to beginning. How should I organize my subject material? How should I make the content engaging and interesting? How should I give directions with simplicity? And, of course, how do I get the book published? Who is going to take it to publishers? How do I write a cover letter? What’s a press kit? How do I create a good title? What do I want on the cover? So many questions! Last year I received the wonderful gift of an opportunity of going to Italy to study oil painting. Three weeks in Florence, Italy. At last I was going to paint! My teachers at the Academy of Art insisted on my copying the masters to produce a painting IN ORDER TO LEARN. I did it, and I was pretty good. Having something to copy seemed to work well for me. My technique and skill developed. I didn’t get the comment of dry color, and my people really looked like people (by the way, I think we do SEE better as we age, not in the sense of eyesight, but in the sense of maturity). After this experience, I decided I wanted more – I needed more! 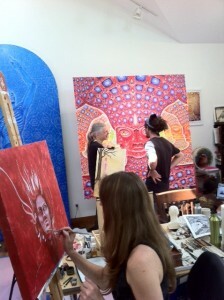 I signed up for Alex and Allyson Grey’s Visionary Intensive held at COSM, in Wappingers Falls, New York. Visionary Art means art that has a message; I liked that idea. You know well by now that I’m into MESSAGES! So here I am, seeing if painting with a vision is going to mean I can finally paint. But there is more to the story. You guessed it, I’m a beginner again! It was a year ago that I was in Italy – so much time has passed. At CoSM, I don’t have a masterpiece to copy, I have to come up with all of it on my own, and it needs to have a visionary message to boot! And here I am…a beginner again. This experience of being a beginner doesn’t seem as easy. I’ve tried to figure out what it is, and I think the answer is that when you’re a beginner, you need to develop new systems, which takes patience. I need to figure out how to transfer a message through images rather than words; I have to figure out how to draw with a paint brush. It is difficult and definitely a rebirth for me. I feel vulnerable; I need to ask questions over and over again. I feel challenged to become patient with the process. Every day we work on a different skill, and today I got a little better with the system of brushes, thinners and cleaning. Who knows what I’ll develop confidence in tomorrow? My style? What will it look like? I don’t want it to look like illustrations, and, of course, so far that’s what I’ve got! !